Slovakian wineries can also boast the varietal that’s the pride of Hungary, since part of the Tokay region extends into Hungary’s northern neighbors. 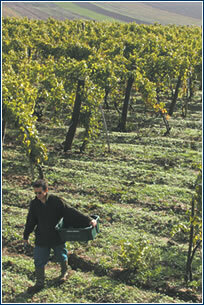 The truth is that in Hungary there are 28 Tokay villages and ten times the area of vineyards as in Slovakia. Furthermore, until recently the Slovak part was quite neglected compared to the Hungarian part, and the quality of the wines produced there couldn’t be compared to their Hungarian counterparts. At a time when most of the Hungarian wineries producing Tokay are owned by foreign companies, much-needed domestic capital has started flowing into the Slovak part, allowing the renewal of vineyards and a wine-making economy. In a neglected Slovakian village, a couple of dozen stairs underground, one may find a perfectly maintained cellar dug centuries ago. On either side of the stairs there are endless rows of carefully tended oak barrels. In them ages the unique golden wine that has been made for 450 years. Tokay came about through the centuries as a traditional mixture of three white grape varietals: Furmint (70%), Lipovina (20-25%), and aromatic white Muscat (5-10%). The secret of Tokay’s flavor and aroma lies in its two-stage production. 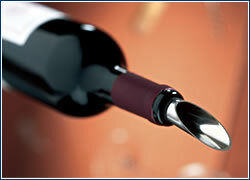 In the first stage, classic wine is allowed to ferment naturally, and is sold as Tokay szamorodni. If raisins afflicted by noble botrytis mold are added to the wine, the result is Tokay aszú. The sweet botrytic raisins are then separated by hand from the ripe grapes and added by the tubful (puttonyos) to last year’s wine stored in barrels (gönci) that hold 137 liters. It is then left for three years to age. In Hungary Tokay aszú is made from three tubs, while in Slovakia you will also get a two-tub variety. The more tubs are used, the greater content of residual sugar is in the wine. Even after the second fermentation, six-tub Tokay must contain at least 160 grams of sugar per liter. The absolute top of the line is Eszencia – a nectar that leaks by itself from gathered raisins. It contains up to 800 grams of sugar per liter, it is obscenely expensive, and it remains beautifully aromatic even after a hundred years. – Not a drop will be wasted with this elegant, metal wine pourer. Produced by Rosendahl, designed by Erik Bagger. Available for CZK 1,200. Don’t forget that in more than a hundred countries the third Thursday of November is the traditional date tasting the year’s Beaujolais Nouveau (this year, on 20 November). In Bohemia and Moravia 2003, wines will be tasted on St. Martin’s Day (11 November). As is traditional, Víno Mikulov, Znovín Znojmo, and Vinné sklepy Valtice will present their new 2003 wines at the Ambassador hotel on 19 November. A basic wine mixture of three varietals with low residual sugar content (max. 10 g/l), distinguished by its typical bready aroma. Its marked golden color testifies to its long aging in oak barrels. Its higher sugar content makes this wine fuller, with a stronger muscat aroma than the preceding selection. This approaches classic Tokaj – 12% alcohol. This wine has an unusually high alcohol content for a Tokay – 13.3%. Most of the wines from this region have about 12% as a standard. For those who don’t like overly sweet wines, you should taste it just to get an idea of the flavor of Tokay from tubs. This wine contains at least 120 grams of residual sugar per liter and is 12% alcohol, like any classic Tokay. After tasting the entire six-degree line, this one fared best, with the lovely, sparkly color of old gold, a fresh toast aroma, and a persistent, sweet, honey-like finish.